I believe that any modern man can't refrain from elaborating his own worldview, a reflection that gives awareness of his own decisions. In fact while the modern man, at least in many parts of the planet, enjoys freedom of thought, of action and he is also free from needs, exercising freedom means that most of his life is a decision chain. The more decisions are based on awareness, being the consequence of coherent thoughts that arise from one's own personal convictions, in contrast to the uncritical acceptance of propositions offered or set by other entities, the more that man is free. 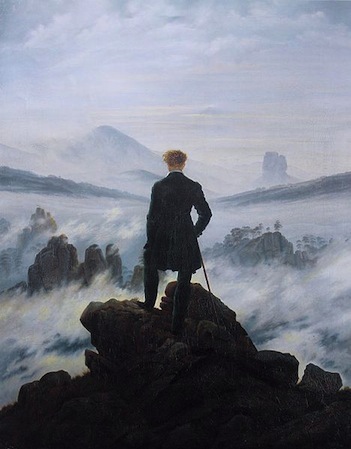 “Wanderer above the Sea of Fog”, Caspar David Friedrich (1818). Hamburger Kunsthalle, Hamburg. Courtesy by Wikipedia. I wrote “any” because this is not a matter for intellectuals or philosophers only; indeed it's a practical thing of every day's life, which affects each of us. In the past, obviously, reflecting on one's own worldview was a privilege for a few people, since the majority of mankind lived its own existence in ignorance, under the oppression of tyrants, at the mercy of diseases, including those that today are considered trivial, famine and war; people barely had the opportunity to survive. Today those chains have been removed and there are no more excuses: missing the full capability of exercising our freedom is basically a denial of our human nature. Liberty is the power that belongs to man to do whatever is not injurious to the rights of others; it has nature for its principle, justice for its rule, law for its defense; its moral limit is in this maxim: Do not do to another that which you do not wish should be done to you. The former statement asserts what each man feels as natural, the aspiration to happiness that is searched by means of free choice. The latter statement puts freedom it in relationship with other entities of the socio-political sphere, in order to define rules of peaceful coexistence and enforce them. Once that boundaries for our actions have been set (in the widest possible way), how do we move inside them (freedom as self-determination)? And since we live in liberal-democratic societies and we can act to shape the rules of coexistence, what make us decide which is the best shape (freedom as participation)? What we need is knowledge, which is at the basis of every choice. In other words, the exercise of freedom can't refrain from the capability of understanding what we want and which choices are really aimed at the goal that we are determined to achieve; also because some extemporaneous choices can lead to unexpected consequences, or to a lesser good than the desired one. This happens because we live in a world that we can't fully control, as it is governed by laws of cause and effect that are outside us (and if one believes in non-determinism, things are even more out of our control). On these premises, the exercise of freedom needs a reasonably good worldview. This requires time and a knowledge effort, in other words the dedication of a portion of our own life; it is a price to pay, but the the unavoidable alternative is not to be the master of our own life, and let other actors live our life (other people capable of exercising an influence on us, fashion, ideology, political parties, economic powers); among those actors there could be our inner irrational impulses and, while the humanity has got a variety of opinions of whether inner impulses should be more or less seconded, contrasted or controlled, I think it's self-evident that acting exclusively and without awareness in function of inner impulses is typical of animals, not human beings. There's a german word, Weltanschauung, a “technical term” in philosophy, that fully describes the worldview concept I'm referring to, taking into account both cause-effect relations and final causes (for those who believe in them); in a way that deals with the fact the man is part of the world and interacts with it; considering a knowledge process that takes advantage of many different tools, both rational and irrational (as intuition). Weltanschauung: noun, German - a comprehensive conception or image of the universe and of humanity's relation to it (Random House Dictionary, 2013); a comprehensive view or personal philosophy of human life and the universe [from Welt world + Anschauung view] (Collins English Dictionary - Complete & Unabridged 10th Edition). A Weltanschauung is not a mere random collection of opinions, but a reasoned “placement” in certain areas, related to the fact that we have beliefs, political ideas, tastes, passions. Why do I believe in this? Why do I do that? Why do I think that this and that are right, wrong, opportune or not? Part of this positions are - or should be - rational; others are irrational and it's a normal thing since the human being is not entirely rational. Being able to understand which choices belong to the rational sphere and which to the irrational one is a good starting point for defining our own worldview. Sometimes some irrational positions lead to a prejudice that can be dealt with by means of rationalization. On the other hand, sometimes we understand that, thanks to our better knowledge of something, the rationalization of a position is no more satisfactory. Perhaps we should think it over, search for other explanations, otherwise ... change our mind. During our life it's unavoidable to change our mind on some beliefs; sometimes changes happen in an undercurrent, so slowly that we don't realize to have moved to the other side of the river, while still believe to be on the starting one. Refusing to acknowledge a contradiction means, above all, to lie to ourselves, to create a mask of ourselves that doesn't fit the substance, which leads to lying to others too; this often leads to wrong choices that present the bill after years. Today I'm fully satisfied with my job of computer engineer. As time passes, I'm expanding my interests to other areas, such as visual arts, music and literature, but this relates to my free time. From a job perspective, my profession is the only one that allows me to make a living, which is the fundamental thing. My attitudes revealed since I was a child; first with an undifferentiated interest for science (physics, chemistry, mathematics) and technology (computer engineering), which later took a definite direction toward the latter. It was definitely a good thing, since when I learned more about calculus I realized that I don't like it, nor I could master it, at the point of having my job relying on it. This made me exclude physics; shouldn't I have done that, today I would be a less than mediocre physicist. Moreover, there was a period in my life in which the arrival of a cat made me passionate about pets: I clearly recall that at the time, when asked about what I wanted to be, I answered a vet. Luckily I later rationalized about that: my skills can't fit with real-time decision making (think of surgery) and I have a serious distaste for diseases, specially contagious ones. I could have never become a vet. Being able to rationalize, understanding who I was, which my skills and my limits were, what I liked and what I didn't, the comprehension of jobs are they really are and not how I idealized them, allowed me to avoid prejudices and external influences; the full exercise of my freedom of choice, based on awareness, allowed me to avoid the wrong choices that I would have paid later. After you make a first, gross analysis of your positions, your rational attitude can help to possibly discover inconsistency. In other words, are we coherent with our beliefs? It is inconsistent to intransigently profess against hunting and eating wild boar steaks at the same time. We can also study whether our positions are realistic or deceptive. We live in a world of “semantic confusion”, that is in spite of increased literacy and acculturation, more and more often we don't fully understand the meaning of words, sometimes we even misuse them. Because of this awareness gap we often deceive ourselves, we introduce a separation between substance and form. If we love nature, are we concerned about animal welfare or environmentalism? Or both? There are choices and actions that are compatible with only one of these things and opposite to the other; but many people don't understand the difference. Having a worldview, periodically reviewing it, keeping it up to date, checking the coherence of our beliefs with it; these are all fundamental things for achieving self-satisfaction and fully live our freedom. Of course, at the basis of everything, this worldview must be the clearest possible.